If you are not familiar with the face (you are of course, but you think of a fictional character, don't you? ): this has been the prime minster of the Kingdom of the Netherlands for the past 7 1/2 years. He presided over four cabinets and is now ready to fix a fifth. Rather incredibly, the Dutch Labour Party pulled away because of the colonial war in Afghanistan (they never did it because of other colonial wars). The words mean "have fallen", it is a joke on a certain telephone company which no longer exists or is existing again or - whatever. A joke that has to be explained is awkward anyway. 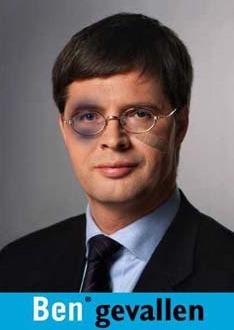 It already circulated three months after Balkenende took office so he may already have reached the books of holding the most and least successful of cabinet offices. At least, in NL. Shamefully, the Christian Democrats and the Light Version of Christian Fundamentalists, the other two coalition parties in Balkenende IV, wanted to prolong Dutch participation in the Afghanistan colonial war. Oddly, the openly racist party that may be the largest after the early elections due in May 2010, supports the withdrawal from Afghanistan. The best way to get rid of these racists seems to be a sixth cabinet presided by Balkenende (if the Christian democrats succeed in being the largest party). It would be the best recipe for a short spell for the racists, who do not have a programme apart from muslim bashing. It all depends whether the officially politically organised Christians are willing to fully extend their war plans to the population of NL itself. It is always best to stay out of the headlines. For now, brothers and sisters, I command you to God, awaiting in fear and trembling what is coming (but still with a smile about the picture above).